Donald Trump and Kim Jong Un of North Korea have in the recent past engaged in a verbal war. Courtesy photo. A visibly unsettled Japanese Prime Minister Shinzo Abe said it was an “unprecedented serious and grave threat” while the UN Security Council called an emergency meeting at Tokyo and Washington’s request. Sirens blared out and text messages were fired off across northern Japan warning people in the missile’s flight path to take cover. Trains were delayed as passengers were urged to seek shelter inside stations. The last time a North Korean rocket overflew Japan was in 2009, when Pyongyang said it was a satellite launch. Washington, Seoul and Tokyo believed it was a clandestine test of an intercontinental ballistic missile (ICBM). At the time, US President Donald Trump issued an apocalyptic warning of raining “fire and fury” on the North, while Pyongyang threatened to fire a salvo of missiles towards the US territory of Guam. South Korea said the latest missile was launched from Sunan, near Pyongyang and flew around 2,700 kilometres (1,700 miles) at a maximum altitude of around 550 kilometres. Guam is about 3,500 kilometres from North Korea — although the missile was fired in an easterly direction and not towards the US outpost, home to 160,000 people and host to major military facilities. Abe said the overflight was an “outrageous act” that “greatly damages regional peace and security”. 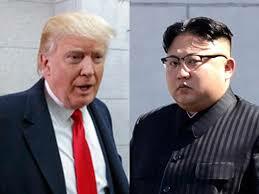 In a 40-minute telephone call with Trump, he said, the two allies had agreed to “further strengthen pressure against North Korea”. Robert Wood, US Permanent Representative to the Conference on Disarmament at the UN in Geneva labelled it “another provocation” that was “a big concern”. But China, the North’s key ally and main trading partner, urged restraint on all sides, with foreign ministry spokeswoman Hua Chunying saying the situation had reached a “tipping point” but warning pressure and sanctions “cannot fundamentally solve the issue”. Russia, which also has ties to Pyongyang, said it was “extremely worried”, hitting out at a “tendency towards escalation”. Any launch towards Guam would have to pass over Japan first and analysts said Tuesday’s overflight presents a major challenge to both Tokyo and Washington. Euan Graham, of the Lowy Institute in Australia, said that a launch towards Guam would have been a “red line” for Washington, and instead Pyongyang selected a “half-way-house option”. “The North Koreans in a way are being quite clever, by asking a difficult question of a key ally in the western Pacific (Japan) but at the same time not ratcheting up tensions to the point where the United States would seriously consider military measures,” he told AFP. They were also “demonstrating they have the control over the cycle of escalation,” he added. After Pyongyang appeared to postpone the Guam scheme, Trump told a rally in Phoenix that Kim was “starting to respect us”. As a result, according to Cha Du-Hyeogn of the Asan Institute of Policy Studies in Seoul: “It looked like North Korea backed off from a game of chicken. But it made no attempt to do so on Tuesday — when the missile flew over the country for two minutes — with defence minister Itsunori Onodera saying generals believed it posed no risk to the country. “Today is really quite a horrible day for Japan,” security commentator Ankit Panda said on Twitter following Tuesday’s overflight.